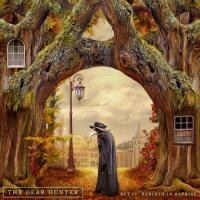 Act IV exemplifies everything that makes the Dear Hunter so ambitious, creative, and special. It's a work of art. There’s always been a theatrical quality to the work of the Dear Hunter (which makes sense since mastermind Casey Crescenzo grew up in a musical family). The group’s first three LPs (which made up the initial half of a planned six-Act epic) demonstrated not only dense, heartfelt storytelling and wonderfully histrionic melodies, but also a plethora of genre-defying deviations and complexities, fusing styles like indie rock, pop, progressive rock, folk, chamber, and Vaudeville in a way no other modern band has done. While the quintet’s two recent deviations from the project—The Color Spectrum (2011) and Migrant (2013)—were both stunning works that retained much of the same specialties, The Dear Hunter is surely at its dramatic best on the Act records (so many fans were still chomping at the bit for a proper follow-up to 2009’s Act III: Life and Death). Fortunately, Act IV: Rebirth in Reprise is now upon us, and it proves that the six-year wait has not been in vain. Far more grandiose, orchestrated, and seamless than any of its predecessors, Act IV flows more like a musical or play than a series of songs, taking the aforementioned larger-than-life scale and remarkable production to a whole new level. Its expanded sonic depth (including more horns, strings, and choral pronouncements) provides a cinematic journey, and its ingenious references to prior Act classics will surely delight longtime listeners. If you were at all worried about how Crescenzo and company would continue the tale, fear not: Act IV: Rebirth in Reprise is another magnum opus that earns its place in the Dear Hunter saga. Fittingly, “Rebirth” starts things off by inducing the vocal counterpoint approach that began Act I and Act III. Although it’s not quite as multilayered as “Battesimo Del Fuoco” or “Writing on a Wall,” its verses are still endearingly engaging, and the explosion of orchestrated quirkiness near the end offers the first indication that Act IV contains many classical layers (as well as many traces of Brian Wilson’s Pet Sounds and SMiLE). Considering that Crescenzo released his first symphony, Amour & Attrition, last year, this newfound emphasis on orchestration isn’t too surprising, and thankfully, it’s largely what makes Act IV so astounding. Next, “The Old Haunt” is your typical Dear Hunter rocker, which isn’t a bad thing, as its chorus—“And there’s far too many ways to die”—is quite catchy. As usual, the arrangement moves from sensitive and mosaic to bombastic and striving, with Crescenzo’s final battle cry—“But now we wake up!”—instilling plenty excitement and emotion. Even better, the final moments of the track contain a reworked treatment of the opening of “The Lake and the River” from Act II, which transitions into “Waves” brilliantly. With its central backing harmonies, poignant lyricism, touching melodies (especially the tragically beautiful bridge), incredible lead singing, and intense instrumentation, “Waves” is easily one of the most mesmerizing and moving pieces The Dear Hunter as ever crafted. It will leave you in awe. More effective recalls to the saga appear in “Remembered” and "A Night on the Town." The former is a luscious ballad full of strings, harmonies, and piano with brilliant pacing and colorfulness. Throughout the track, Crescenzo reminds us that “The flame may be gone, but the fire remains.” Afterward, "A Night on the Town" storms in with a fury of horns, percussion, intertwining sentiments, rising vocals, and various other tones, culminating in a centerpiece truly reveals how Act IV is likely the Dear Hunter’s most ambitious and confident record yet. The first half is a frenzy of shifting temperaments and dynamics, while the latter half incorporates aspects of both “The Bitter Suite I and II” (from Act II) and “Mustard Gas” (from Act III) to close on a mournful and delicate ether. “Is There Anybody Here” contains more earnest melodies and rich arrangements, while “The Bitter Suite IV and V” also contains creative signals to its earlier chapters, including an exceptional nod to “Evicted” (from Act II). Of course, it’s excellent in its own right as well, with an ominous chorus and a playful score making it both sinister and fun. Likewise, “The Bitter Suite VI” subtly alludes to the verses of “Son” (from Act III) as it moves along its impassioned, sorrowful path. Like “Rebirth", its closing orchestral panic (with sporadic percussion) makes it even more surprising. Honestly, “King of Swords (Reversed)” moves along a funk/disco path that feels a bit out of place (actually, it’s a bit reminiscent of “Number City” from Coheed and Cambria’s The Afterman: Descension); however, it’s still charming, and you can’t fault the group for trying a new slightly direction. After some footsteps, bird chirps, and entrancing guitar feedback, “If All Goes Well” glides along quickly (it’s almost danceable), with fantastic energy and dynamic changes, moving from a forceful and hip rocker to a lavish amalgam of majestic instrumentation and multifaceted singing. The most affective moment on Act IV, “The Line” is a ballad in the same guise as “Things that Hide Away", and it’s arguably just as heartbreaking and gorgeous. Crescenzo sings, “It’s the end of the line for you and I / Don’t make believe we even tried” as acoustic guitar arpeggios, percussive shakers, bells, strings, and harmonies surround his tender laments, showcasing how the softness music can also be the most stunning. Halfway through, Crescenzo issues an empowered, weighty new direction, which adds a hopeful tangent. “Wait” begins like a lost track from the Black EP of The Color Spectrum, with aggressive vocals, delayed percussion, and slightly industrial production fusing much like they did on that collection. It’s easily the most straightforward track here too. Following this, more orchestration leads into the antagonistic yet fragile start of album closer “Ouroboros", which would’ve fit well on Migrant. It doesn’t feel as much like a substantial cliffhanger as prior Act finales, but it’s still quite riveting, with a dense and vigorous chorus (“I fell down and then I fell apart / I never wanted to hurt no one”) gliding in amidst atmospheric rock anarchy. Once the initial song ends, a wholly different section begins, with silky singing soaring over strings and more Brian Wilson-esque percussion. His final line—“Foolish plans kiss foolish hearts goodbye / Traveled too far from the riverside”—connects this entry into the saga even more, as well as paves the way for the next chapter. Act IV: Rebirth in Reprise is yet another masterpiece in its creator’s canon. The Dear Hunter has always been one of the most striving, multifaceted, imaginative, skillful, and just plain extraordinary bands of its generation, offering a blend of musicianship, creativity, songwriting, and storytelling unmatched by its peers, and this record serves as even more confirmation of that. Sadly, this album also reminds us how the Dear Hunter is still criminally underappreciated by the industry and media as a whole. With any justice, Act IV will appear on many ‘Best of 2015’ lists, which may finally allow The Dear Hunter to achieve the acclaim and widespread audience it’s deserved for the past decade. Bring on Act V!